The Stayman Bidding Convention is one of the first conventions that beginning players will learn and is widely used by beginners and experienced players. It is used by responder if partner has opened the bidding with a No Trumps bid – 1NT or 2NT. It is used to find out if the partners have an 8 card fit in a major suit and is used only if game (25+ points) might be possible. Most commonly Stayman is used in response to an opening bid of 1NT. The opening bid shows that partner holds 12 -14 points (in Acol bridge). If responder holds 11+ points then there is the possibility of the partnership holding 25+ points – enough for game. Typically you will use Stayman if you hold 11+ points AND a 4 cards in either major suit. You know that partner has a balanced hand – indicated by an opening bid of NT. You will also assume that they probably don’t hold a 5 card major as, in Acol, they would have opened by bidding their major suit. You use Stayman by making a bid 2 Clubs. This doesn’t tell your partner anything about your holding in clubs, it is asking partner if they have a 4 card major. A 2NT opening shows that partner holds 20 -22 points (Acol bridge) or 21 – 22 points (American Standard). In this case you only need 4+ points to reply (to be sure of enough points to bid for game), and sometimes it is worth checking to see if you can find a major suit fit rather than bidding 3 NT. Consider the hand like below. What might happen if South bid 3 NT directly instead of seeking a possible 8 card fit? The defenders could lead a spade. Between the N & S hands you hold 5 spades, which means the defending partners hold 8 spades. There is a high chance that the spades will split 5/3 or 6/2 and you will lose the first 5 or 6 tricks. A contract in hearts would allow you to trump after the loss of the first two tricks. 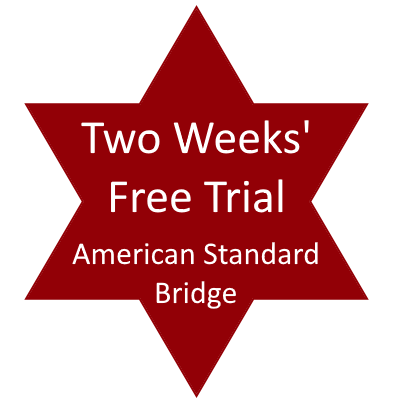 You can find lots more information about how and when to use the Stayman convention if you join No Fear Bridge for your two week trial membership. Just Click Here to go to the UK (Ac0l) sign up form, or Click Here to go to the US sign up form. No card or personal details are required for the trial. « Should I Draw All The Trumps?